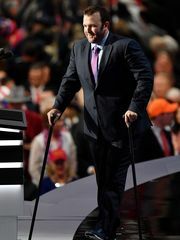 Who is Brock Mealer, the Motivational Speaker with a Disability, who Spoke Thursday Night at the RNC? Cleveland, July 22 – “Mr. Trump, welcome to the club,” Brock Mealer said excitedly while standing at the podium of the Republican National Convention on Thursday night. The club he is referring to is the group of people who can say they overcame one percent odds and achieved success. According to stats cited by Mealer, Republican nominee Donald Trump was given a one percent chance to receive the Republican nomination for President of the United States last year. Mealer’s story is different. On a December night in 2007, Mealer was involved in a car crash, which killed his father and brother’s girlfriend. Mealer’s brother, who was also in the car, pried the door off and removed Mealer from the wreckage. The accident severely damaged Mealer’s spinal cord and doctors gave him a one percent chance to walk again. Mealer was walking again within two years. In celebration, he walked onto the football field of the University of Michigan with his family for the commencement of the season. Since then he has been spreading his message of perseverance to others around the country. Mealer was given a one percent chance to walk again and refused to acknowledge that he could be paralyzed for the rest of his life. Mealer reiterated this message Thursday night, stating that he couldn’t have made it without the support from those dear to him, also stating that Donald Trump can’t make it without the support of everyone in attendance. Billed as a “walking miracle,” members of the disability community were concerned about the message of perseverance vis-à-vis overcoming a disability within Mealer’s appearance. Next Post How do Convention Goers at the RNC with Disabilities Feel about Trump and Republican Party? make sense different ! keep it up.